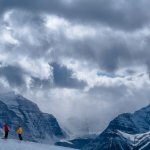 The Lake Louise Ski Resort is the giant of Canadian skiing with amazing views – be sure to take your camera on your ski holiday! 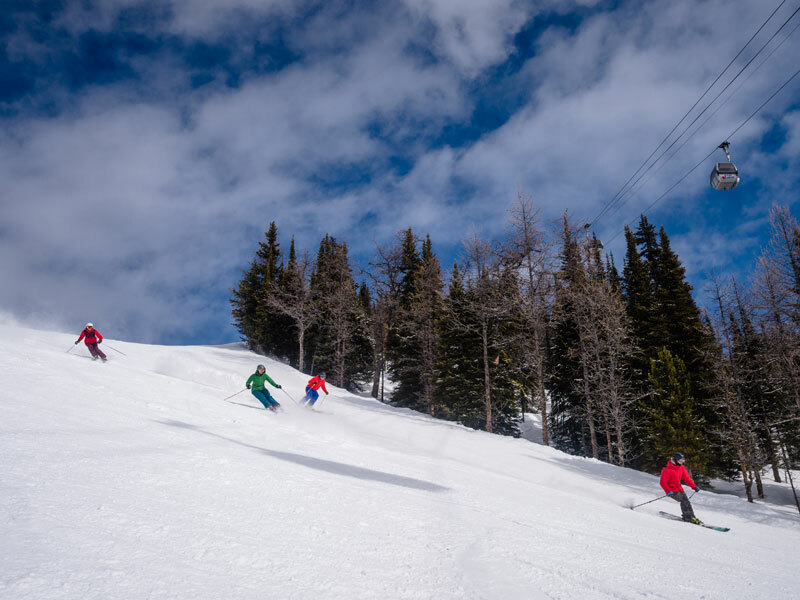 Explore gentle slopes, glades, chutes and wide open bowls spread across four mountain faces with terrain suitable for all levels of skier/boarder. Banff National Park is an untouched wilderness and a Unesco World Heritage site in the Canadian Rockies. The mountains here are so rugged, their jagged and twisted shapes tower into the sky. Glaciers plunge to the valley floor far below, while the lakes and rivers at their base lie frozen and still. 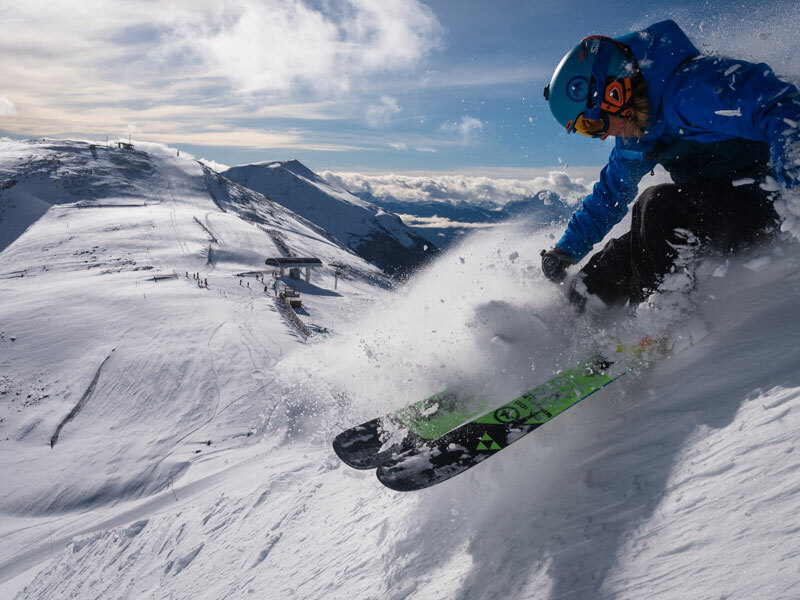 The spectacular Canadian Rockies is where you’ll experience three world-renowned ski resorts of Banff Sunshine, Lake Louise Ski Resort and Mt. Norquay. 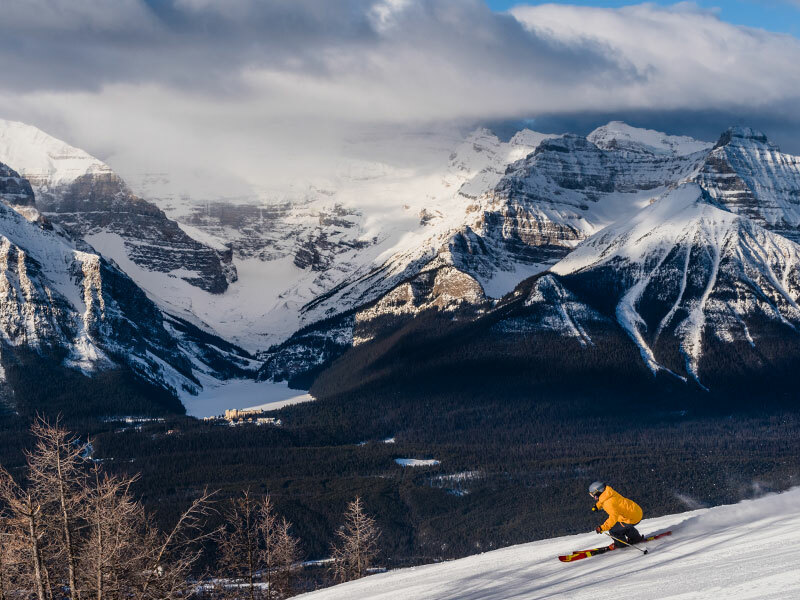 Banff and Lake Louise enjoy 9 metres of famously light, dry powder snow each year, and boast one of the longest ski seasons in North America (November to mid-May). 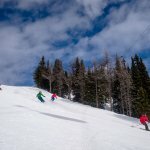 These iconic resorts share 8,000 acres of skiable terrain, 2 gondolas, 26 chairlifts and piles of light, silky snow every season. 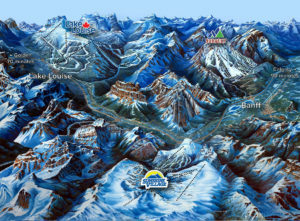 The best part is, it takes just one lift ticket and you can ski/board all three resorts for an amazing ski holiday! 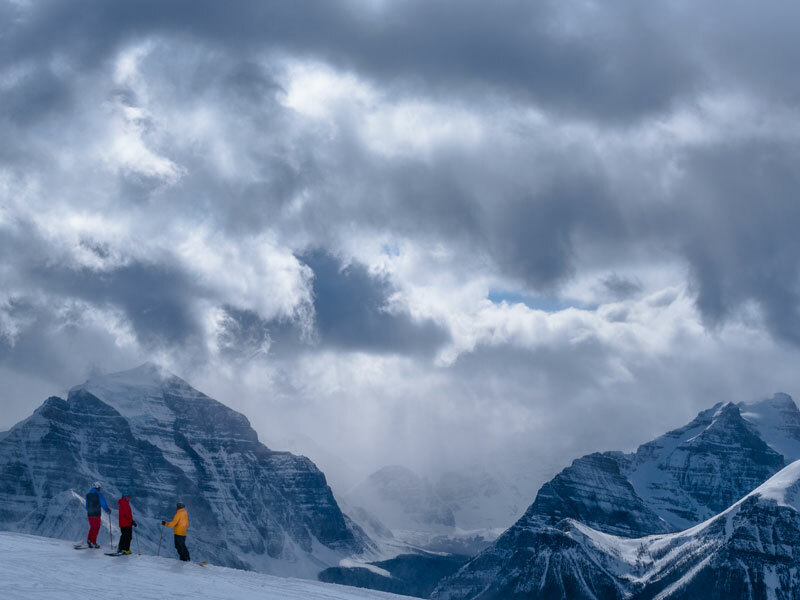 At Lake Louise there is more on offer than just world-class skiing and snowboarding with amazing adventures adding to your ski/board winter experience. 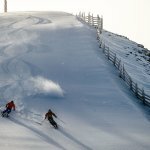 You can enjoy spectacular ice walks in frozen canyons, snowshoeing, dogsledding, horse sleigh rides, hot springs, ice fishing, tubing, snowmobile tours, fat biking, pond ice hockey, heli sight-seeing, ice skating and winter wildlife viewing. The options are endless in this winter wonderland. Keep your eyes peeled for deer, elk, moose, and big-horned sheep! This three hour tour will include some of the most scenic and historically significant highlights of Banff, such as the Banff Springs Hotel, Bow Falls, Surprise Corner, Hoodoos Lookout, and Lake Minnewanka. Take the day to explore postcard-perfect Lake Louise! 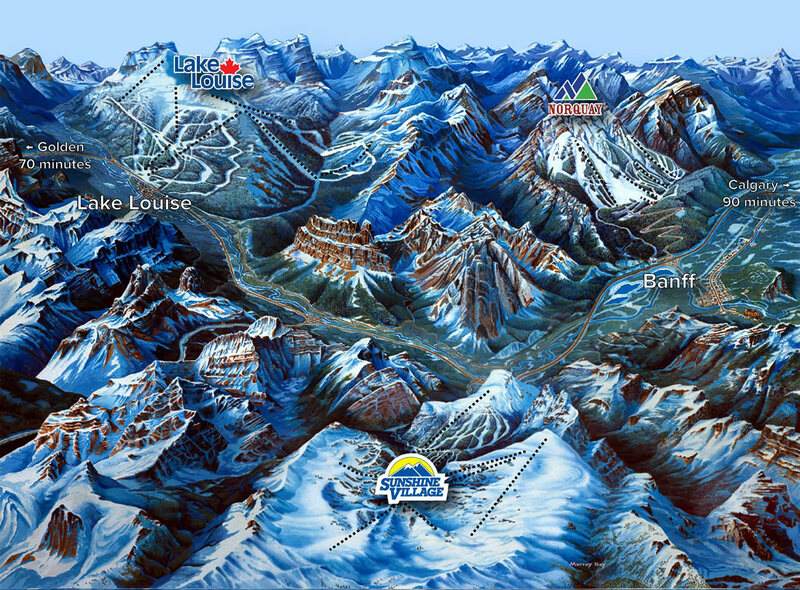 Travel by guided bus tour to Lake Louise, along the scenic Bow Valley Parkway. With 4 hours free time at Lake Louise you will have plenty of time to explore on your own, rent a pair of skates and glide along the lake, take a horse-drawn sleigh ride, or warm up with a hot drink at the elegant Chateau Lake Louise and soak up the views. Crunch through the fresh powder as you hike on snowshoes through the Marble Canyon, a 40-metre deep gorge worn away over centuries by the rushing waters of Tokumn Creek. After your crisp winter walk through the canyon, enjoy a uniquely Canadian treat of hot maple taffy poured into snow to make a sweet frozen dessert. Travel through prime wildlife habitat and admire the frozen waterfalls of Johnston Canyon. This popular ice walk will lead you along steel catwalks built into the canyon walls, past the lower falls and to the breathtaking upper icefalls. Learn the history and formation of the canyon before stopping for refreshments and the chance to take in the surrounding scenery. Heighten your senses, appreciate the darkness and enjoy the silence of a night beneath the stars! Follow your guide to Johnston Canyon’s lower falls along suspended catwalks, through a natural tunnel onto the viewing platform beside the cascading falls. As you return take the opportunity to turn off your headlamp and let the light of the moon and stars guide you back through the pine forest. 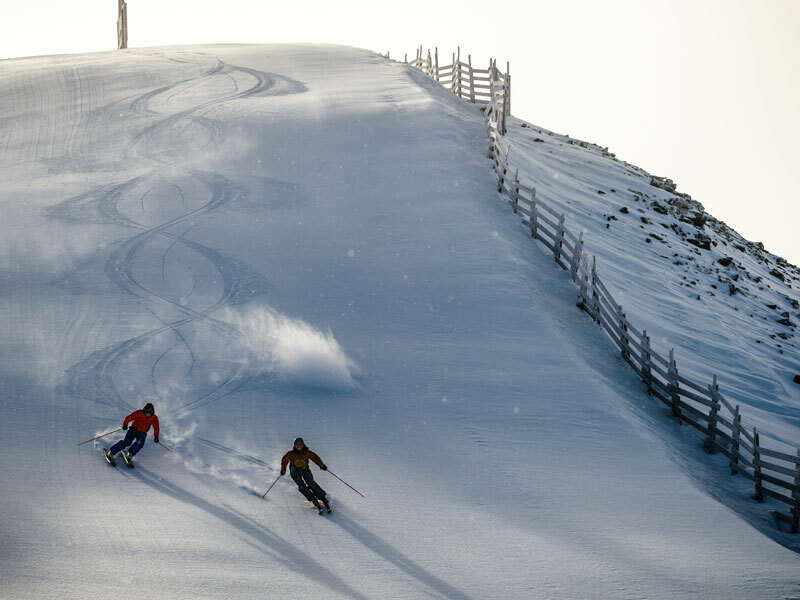 Take a day trip to one of the most thrilling ski resorts in Canada. 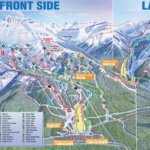 The Powder Express Shuttle will arrive right as the gondola opens so you can get in as many runs as you like. 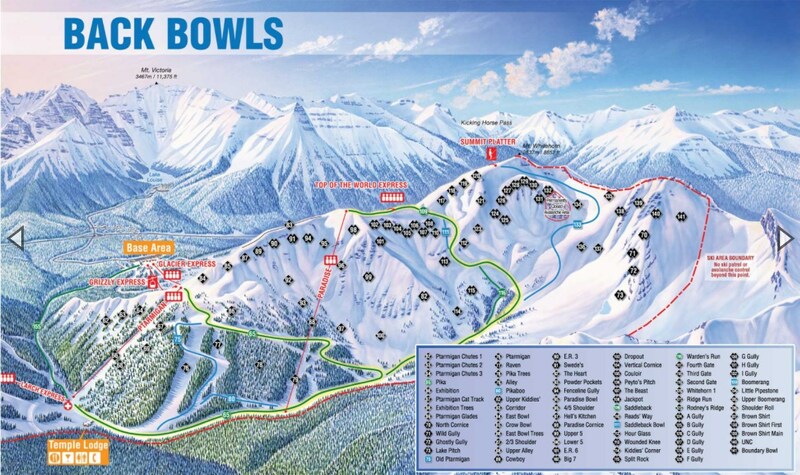 With plenty of steep runs and deep fluffy powder, Kicking Horse offers adrenaline pumping vertical runs, tree runs, steep chutes and wide-open bowls. Listen to the roar of the crowd and watch players glide across the ice. Your trip wouldn’t be complete without a fun filled evening at a Calgary Flames hockey game! Mush your own sled and have a hands-on dogsledding adventure through the Canadian Wilderness! Get to know the beautiful and friendly Canadian Huskies as you learn to harness and handle the dogs, before heading out on the snow covered trails of Goat Pond and enjoying the panoramic views. At the end of the trail, gather around the warm, cozy campfire while sipping hot beverages and sampling some delicious snacks. After being picked up from your Banff hotel you will head to Kicking Horse to experience the excitement and thrill of driving a snowmobile through the magnificent Rocky Mountains! You will be guided through the mountain trails on your own 600cc snowmobile, travel along the edge of an alpine valley and enjoy the panoramic views before stopping for a delicious mountainside BBQ lunch by the fire. Fly into Calgary International Airport, the closest airport to Lake Louise and located only a 2 hours and 10 minutes scenic drive away. 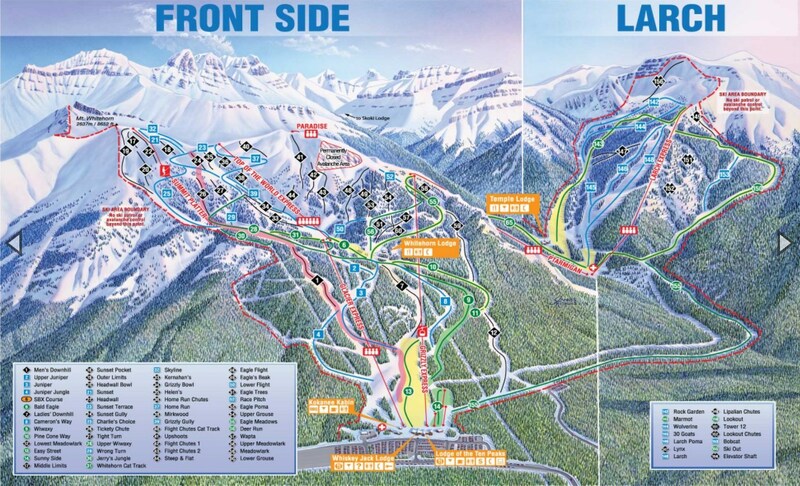 Lake Louise has a variety of accommodation options to choose from.